With some of our favorite local productions coming to an end (Portlandia, Librarians, and Grimm. Oh My! ), you may not realize just how many new things have started filming around town. Seems you couldn’t swing a jib this year without hitting another hot set, or scroll your news feed without another call for extras. That’s because the local film industry was lit in 2018. Here’s a rundown of just some of the movies and shows that may have been filming on your block. Based on the children’s book series, Walt Disney Studios’ brought Timmy Failure through Oregon this summer. Starring Ophelia Lovibond (Elementary) and directed by Tom McCarthy (The Station Agent, Spotlight), the film’s release is slated to coincide with Disney’s new streaming service in late 2019. Speaking of digital platforms and adaptations, Portland was home to Netflix’s new upcoming series, Trinkets and Shrill. Trinkets is based on a young adult novel of the same name that centers on the unlikely friendship of three girls who meet in mandated Shoplifters Anonymous meetings. Shrill is based on Lindy West’s memoir Shrill: Notes From a Loud Woman. In it, Aidy Bryant (SNL) portrays Annie, a boisterous and self-described fat woman who wants to “change her life but not her body.” Already gaining some serious momentum, Elizabeth Banks and Lorne Michaels served as executive producers while John Cameron Mitchell (Hedwig and the Angry Inch) also starred. A spin-off of Pretty Little Liars, The Perfectionists 10-episode season has been picked up by Freeform, formerly ABC Family. The biggest news is that Sasha Pieterse and Janel Parrish will be reprising their roles, Alison DiLaurentis and Mona Vanderwaal respectively. Much like PLL, the show will feature a murder mystery, and introduce a number of new actresses including Sofia Carson (Descendants) and Sydney Park (The Walking Dead). The show is rumored to answer questions from the PLL finale and arrive in 2019. In addition to full series’, Portland and the surrounding areas saw the production of several episodes. Angie Tribeca, a satirical cop show on TBS, brought its star Rashida Jones (Parks and Recreation) through the Mt. Hood area in mid-February. In its second season and found on go90 murder mystery In the Vault filmed between Portland and LA. The show features an ensemble cast of young up-and-comers—Audrey Whitby, Timothy Granaderos, and Claudia Lee— and has been met with rave reviews. Fred Armisen’s newest project, mockumentary series Documentary Now!, filmed much of season 3 in Portland. The third-season premiere episode “Batsh*t Valley,” a parody of Netflix’ Wild Wild Country, filmed in Oregon and is scheduled for February 2019. The episode stars Owen Wilson (The Royal Tenenbaums, Zoolander), Michael Keaton (Batman, Birdman), and Necar Zadegan (Girlfriends’ Guide to Divorce). Indie powerhouse and lover of Oregon as a backdrop, Kelly Reichardt brought her newest production through Portland. A follow-up to the acclaimed Certain Women, First Cow tells the story of fur trappers in the 1820s. The film is based on Jonathan Raymond’s 2014 novel The Half Life. No word yet on who plays main characters Cookie and Henry, but her films are known to star the likes of Michelle Williams, Peter Sarsgaard, Jesse Eisenberg, and Kristen Stewart. After all that, you might ask what we could possibly look forward to in the new year. After a successful Indiegogo campaign, Happy Hour History has already completed shooting their first episode and plans to film more in the new year. With local producers, cast, and crew, each episode begins with a classic cocktail, tracing them back to a historical event that changed our modern world forever. With growing momentum each new year, there’s no doubt that the local film-industry will continue to see exciting new projects in 2019. Stay tuned! The EXO Car is now available in the PNW! The EXO Camera Car is a custom mobile electric camera platform made by Telescopic Camera Cranes Inc. From pacing runners to chasing dogs, this is the quietest and smoothest motion for your picture! The air ride suspension allows for super quiet, power-enabled movements. And, because it’s electric, it is exhaust-free. It maximizes the power-to-weight ratio, minimizing the weight of the gear, and includes a generous selection of accessories. With its complete cheese plate exterior, the mounting options are endless! For more details on the EXO Camera Car, check out Telescopic Camera Cranes. Call Gearhead for more information, pricing, and availability. 503-542-3990. Production Office Rental – Now Available! New for 2016: Our production office is now available for rental! Whether you are doing a one day commercial shoot or a long format production, there is enough room here for your whole team. The 388 square foot room has a counter along two walls with room for six or more to work comfortably and there is a four seat conference table. The space is heated and air conditioned. Networking, internet and printing are available as well as kitchen and lunchroom. Thanks to all for such a fabulous 2015! We are looking forward to an even grander 2016! Please note: Gearhead Production Rentals will be closed this week. We will re-open on Monday the 4th for business as usual. If you need anything at all during this time please call 503-542-3990 and select option 8 to be connected to our online staff. We are now a LiteGear Dealer! Gearhead Production Rentals is proud to announce that we now carry LiteGear products. We are especially excited to offer a wide range of their VHO Pro LED Literibbon. With a CRI of 95 Literibbon is available in daylight, tungten or bi-color hybrid versions. It also comes in a variety of lengths, widths and densities making it possibly the most flexible lighting product you’ve ever used, literally! We have a wide variety of Literibbon in stock. Come by and check it out! 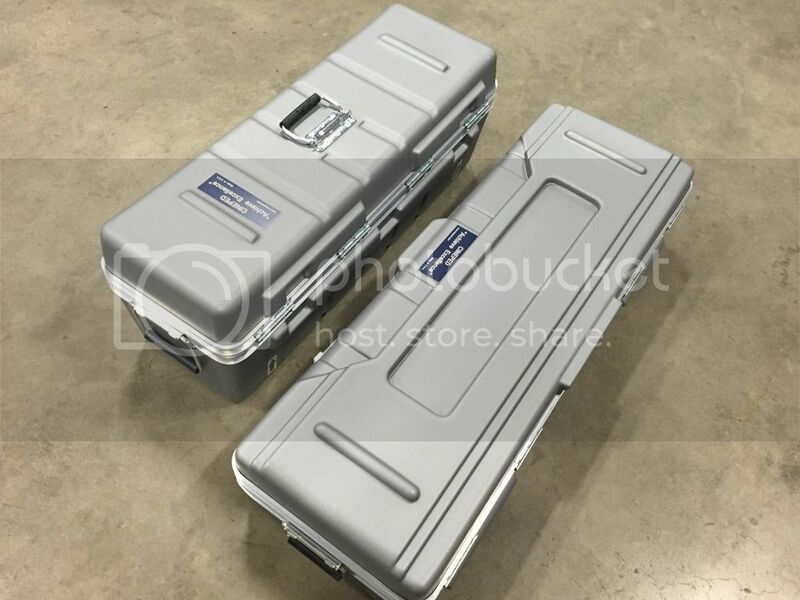 Now available from Gearhead: the Paralleling Control Box for Honda 7k generators. This innovative technology* enables you to run two unmodified Honda EU700is or EU6500is generators in parallel and power loads larger than ever possible before from a small generator setup (up to 120 amps)! Combine this with one of our 60 amp transformers the the flexibility is unprecedented. Give us a call and we’ll tell you all about it. Here is a picture of this setup running an Arri M90 and a 4k par at the same time (with power to spare)! The Cineped Camera Slider is Here! 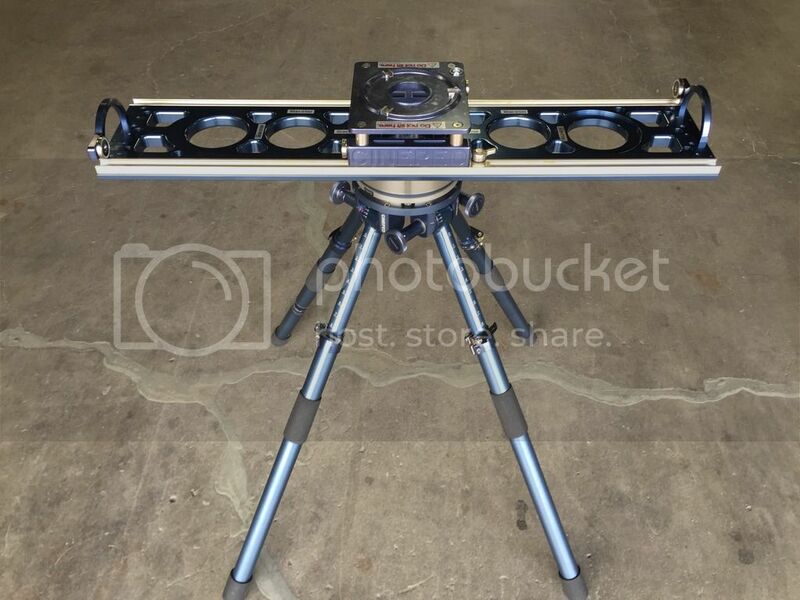 Now available for rental: the Cineped rotational camera slider. 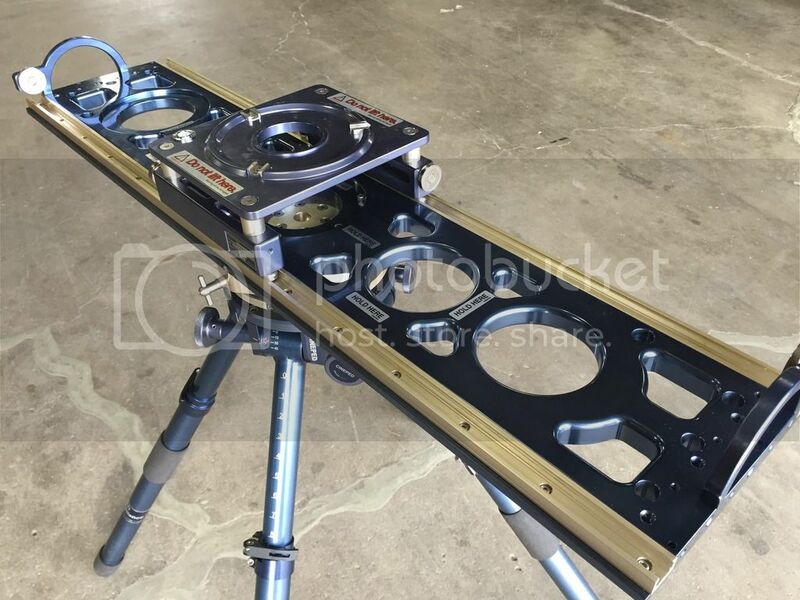 The Cineped is a 32″ Mitchell to Mitchell camera slider that boasts some amazing innovations. In addition to super smooth side to side movement, the Cineped’s unique rotary bearing mount allows for rotational movement as well, creating a myriad of new possibilities for camera movement. The Cineped includes 100mm and 150mm ball head adapters and it supports up to 95 lbs, making it compatible with any camera system. The Cineped is available by itself for mounting on a Fisher dolly or other camera support system, or with the Quattro 4-leg quad-pod. 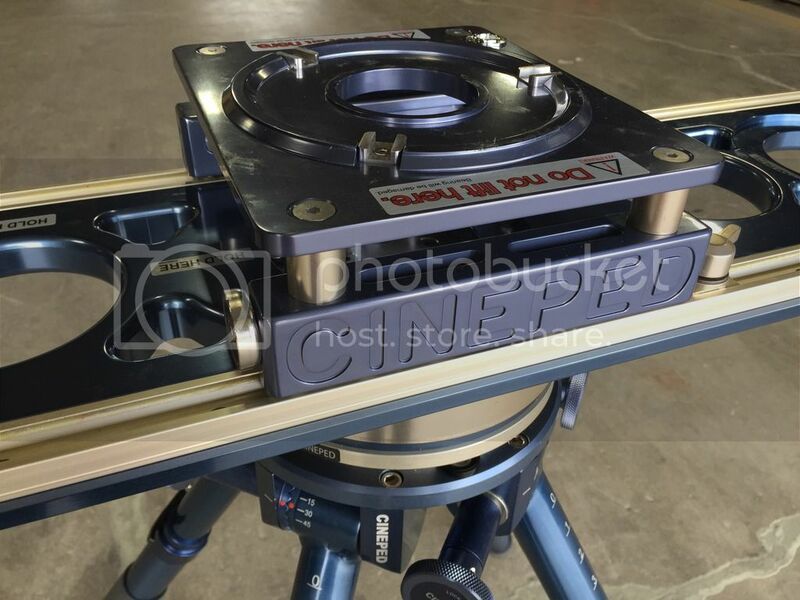 This unique support system provides unparalleled support for the CinePed, virtually eliminating the side to side shifting usually experienced when using a slider. With the Quattro the Cineped becomes a super stable, super flexible stand-alone camera support / movement system.